I was that person who would make other people look bad in my old career. It wasn’t intentional. I could just bust through an action item list like Wonder Woman through a line of machine guns. I was focused, read super fast, typed even faster, and could easily assemble plans of action to get things done on the shortest possible path. I was kind of a superhero. I was also often miserable. But that’s a story for a different day. When I talk about focus I do so from a place of experience getting a ginormous amount of things done. It’s a part of my natural gifts. I can easily see the through line to get things done. But I also come from a background as a younger person in high school and college too, where I was smart enough but rather disorganized and I seemed to underachieve based on my potential. I had plenty of good grades and could ace a test even when I forgot to study - but I never really got as good as I could get back then. A part of it was my focus. I was scattered in a lot of ways. My vision was not sharp. I did not know what I wanted. So I was often floating on the wind. These days I’m very clear on my objectives. And in my old career I was crisp too. I knew what needed to get done and the major moves to take me there. The contrast between these worlds that I’ve lived in is incredible. They younger and older versions of me are differentiated, in extraordinary ways, by focus. This is the wisdom for you today, starhearts. 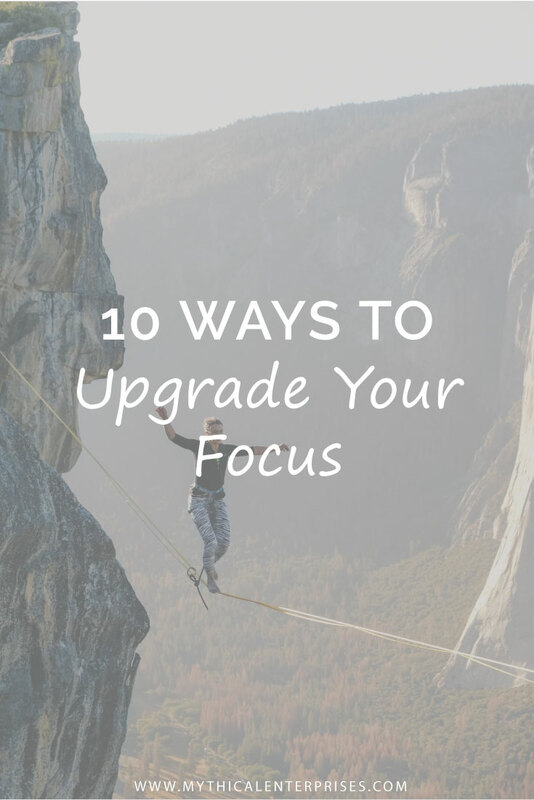 How do you upgrade your focus to get work done with ease and grace, and still sprinkle in rest and play? Get clear about your objectives. Really, really clear. People say they are clear but then… they aren’t. What is your business goal this month? This week? Today? It’s ok not to know. But jump on this as a prompt to get clear. Psssst - It doesn’t have to be numbers. It can be spiritual. A client of mine has “joyfully associate money energy with their business” as a short-term objective. Isn’t that the sauce? Trim your action to bite-sized pieces. The to-do list expansion is kinda scary. I’ve had to-do lists where it looked like I was invading Antarctica. That’s overwhelming and it stops you from taking any action at all! It’s important to identify reasonable actions to take, based on the vision you want to achieve. For instance my priority right now is sharing my Incubator and being of service to spread the word about my gifts. So a lot of my action item list is centered around preparing for my Business School webinar (Ohmylanta! It’s super soon!). But I don’t have “do webinar” on my list. I have draft slides, test webinar platform, select date/time & share with audience, craft call script. All of these are achievable in short bursts. Keep your to-dos manageable! Prioritize your time against your vision. Take action on your priorities first thing, before you social sauce it up in the morning. (Decision-making is a reservoir that you deplete - so is creativity. Do the hardest and most important things first in the morning - when you are at your best) If you don’t know how much time you are spending on social media, use an app like Rescue Time to find out and then decide if that is in alignment with what you’re trying to achieve. Meditation = focus boot camp. Once you get started doing something, really in your groove, you may be good to go. Some people have a tough time getting into that flow state. Lots of distractions, inner and outer, can show up. Then with every distraction it takes an estimated 25 minutes to get back into a focused state. The secret sauce here is to have a daily stillness practice. Even five minutes consistent can change your life. The most successful people on the planet have a daily stillness practice! Let’s be real. Sometimes procrastination is holy! Sometimes we get focused on what we should be doing, instead of what delights us and reflects our deepest pleasure. Or we think that in order to want something we have to be the ones to deliver it. That can feel really hard. And like not a lot of fun. The truth is that the Universe is supporting you in delivering what you ask for - so if you aren’t getting what you want, you need to consider the ways that your problems are serving you. Are you following the energy of what wants to happen? Are you trying to force it? The Divine Program Manager can step in to support you. But you have to unclench those hands, starhearts. What was the last win you had? When was your last celebration? If the first answer was yesterday and the second answer was last year you have an interesting contrast! Gratitude is a way to ingrain in your body the sense of victory - which is critical because that will upgrade your energy state (drawing more good stuff towards you!) and help you train your brain. You are deepening the grooves of joy in your brain when you practice celebrating your victories. Remove the objects invading your work space. Make it beautiful. If you have unfinished activities reflected in papers, old mail, broken objects - organize, donate, and generally clear until you have a welcoming beautiful space that gives you joy. No matter what state your area, or budget, is in - you can create beauty with intentionality (and resourcefulness!). I’m just going to tell you that it works. You should give it a go at least once! Work in paper (not on your phone or computer where distractions reside). I started realizing (and giving myself permission) to have the experience of disruption from electrical devices. It’s moved me towards paper for my writing and creative projects. It’s made one hell of a difference. There are some tasks I only do on paper. If I start them on my laptop I go down twenty kinds of internet rabbit holes and the dern things never get done. If you don’t yet I highly recommend you experiment with creation and writing outside of your digital devices. Get out into nature for inspiration, calming, peaceful space. Nature is calming, grounding, and focusing. It strips away the mental chatter and lines you up with your highest knowing. If you are having trouble getting and staying focused, go to your local park (or find a tree) and breathe. Do that for fifteen minutes and see how you feel. Some of the most creative people I know are connecting with nature on the regular and just acting as nature’s wing man in their entrepreneurial endeavors! Speaking of wing men - and wing women. I help business owners focus on the key moves that are going to get their gifts out into the world, and support them in doing it in their most natural, powerful, and joyful way. The program is high-touch and I’m LOVING it. So are my clients. Check it out over here.